Cooling towers have become essential for many industries. There are various benefits of installing cooling towers, which are reduced energy consumption, reduced cost, longer lifespan, and less maintenance. Due to such advantages, many industrial units have opted for installing cooling towers in their units. The demand for proper installation of the cooling tower is increasing and due to such demand industrial cooling tower manufacturers in India are trying to provide a quality solution to their customers. Various factors affect the functionality of cooling towers, such as following proper maintenance process, using high quality parts when replacement is required, and so forth. One of the crucial elements of cooling towers is drift eliminator. This drift eliminator plays a vital role in the proper functioning of the cooling towers. Let’s see what drift eliminator is and what are the benefits of using it. Drift Eliminator ensures that the water recycling process is in perfect condition. Its function is not limited to saving water, but it also prevents the release of chemically contaminated water into the environment. To define Drift Eliminator, we can say that its primary purpose is to reduce water loss and emission. 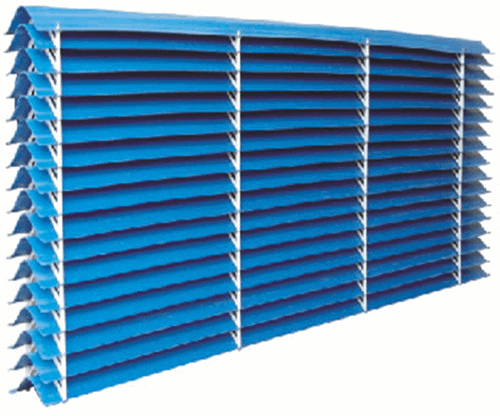 It keeps the drift rate at a minimum level and also reduces the frequency of pressure drop in a cooling tower. What are the main benefits of using drift eliminators? There are several benefits of installing drift eliminators in cooling towers, especially in the large scale production units. The advantages are not only for the owners, but it also contributes to the betterment of the environment. Let’s take a look at some of the top benefits. It prevents the icing of nearby field and roads. It keeps the electrical parts and piping systems in proper condition by preventing corrosion. Short circuits, which often occur due to damaged electrical parts can be prevented. Drift eliminators ensure that the emission of hazardous chemicals into the environment is significantly reduced. Water conservation at a large scale is possible due to drift eliminators. Pressure drop in water is frequent in the cooling tower which can be reduced using drift eliminators. With the drift eliminators in cooling towers, there is no need for additional water treatment. The lifespan of a cooling tower is also increased. It significantly reduces energy consumption. For the cooling tower, water treatment drift eliminator is one of the essential parts. It has a simple structure, and that makes it very easy to use. The installation of a drift eliminator in a cooling tower is also quite simple. Seals are added at the time of the installation. Its primary function is to prevent drift bypass. It ensures that no droplets of water are released at the time of the redirection process. As we have discussed, a drift eliminator prevents water contamination. The filter ensures that no harmful chemicals are released into the environment. There are different types of wall and blade designs available, but they all have one function, which is to force the water back into the cooling tower for the reuse. There are different types of drift eliminators available in the market. However, most of them can be divided into two categories, one is counterflow eliminators and the second is crossflow eliminators. The mechanism of counterflow eliminators enables airflow through the fillings vertically at the top. At the same time, the water flows from top to bottom. This mechanism exhausts more amount of air at a faster rate than the process of absorbing air inside. There are various advantages of counterflow eliminators, such as low consumption of energy, low maintenance, lower pump head, and plume abated systems. Counterflow eliminators have vertical air flow, while crossflow eliminators have horizontal air flow. In both types, the water flows in a downward manner. This type is also famous for using a splash type of fill. It is cost effective. There are several other advantages of using this type of eliminator, such as low noise production, the minimum requirement for the maintenance, excellent performance, and also low energy consumption. Drift Eliminator also comes in different designs, but the model can either have a counterflow or crossflow mechanism. It depends on the installation, whether it is installed vertically or horizontally. These are mostly gauged blades bounded by caps at both ends. These blades are lightweight but have excellent durability. These are closed cells, giving an impression of structured waves. The function is to force the water droplets into three different directions. It creates a centrifugal force, which ensures that the drift is away from the air flow. Installation of and removal of this design is easy due to its robustness and lightweight. It has a better lifespan compared to other designs and can be ideally used in retrofitting. This type comes with fillings of carbon black, which is mixed with the main material to increase longevity. Such fillings also make it corrosion resistant. If you are looking for FRP cooling tower manufacturer, you should also inquire about the drift eliminators used in the design, and what types of materials are used. Today, manufacturers have limited the number of materials used in drift eliminators. However, it does not mean that the quality is compromised; they are designed to serve its purpose in the best possible way. It is a recyclable material that includes both fiber and plastic. 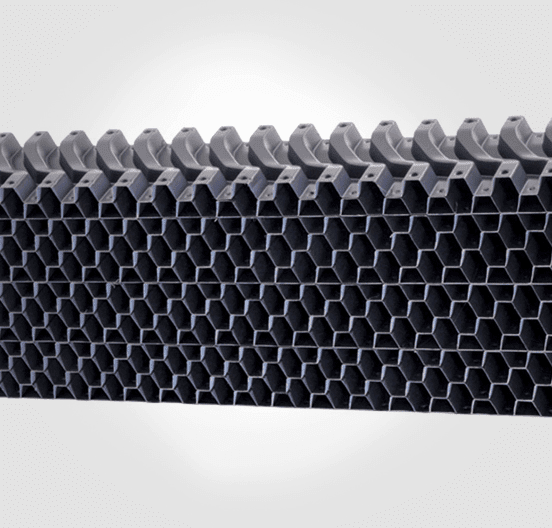 It has better heat resistance than PVC and also has excellent strength against moisture. However, it is at risk of degradation when continuously exposed to UV rays. This material is highly popular, and it is also the most affordable. It is corrosion resistant, but it is also known to come with toxic byproducts. Steel drift eliminators are highly popular for use in higher temperature and container shipments. Metal comes with the high risk of corrosion, but proper coating can reduce such risk. Different models are available in the market to have different specifications. Here are some of the most common specifications of drift eliminators. Installation type, which can be either counterflow or crossflow. Whether you are installing FRP induced draft cooling tower or FRP round cooling tower, installing a drift eliminator can prove vital for the project. We have discussed the benefits, and it does not only reduce the cost, but it also contributes towards the betterment of the environment. It now clear that drift eliminator can prove as a beneficial product.